Should I Always Go for Royal Flush in Video Poker? Should I Always Go for a Royal Flush in Video Poker? We get a lot of questions about the right play when it comes to video poker here at Silver Oak. You may not have even played video poker, but it actually has quite a loyal following, and it is for mostly the following reason: all of the odds are static. If you are the type of player who loves poker, but hates the shifting variable nature of playing live where bluffs are a consideration, then video poker is for you. It’s sort of like if Rounders is a movie about poker, then playing video poker would be like watching NBC’s Las Vegas—it’s predictable, and yet it’s exciting enough to do it for hours at a time. Each has their loyal audiences. Q: Should I Always Go for Royal Flush in Video Poker? Well, let’s look at the odds to find out. Video poker uses a standard 52-card deck. Because video poker allows a player to draw additional cards, the perfect strategy player will average one royal flush every 40,388 plays. The actual chance of hitting a Royal Flush naturally is much higher, but in this case where we say “perfect strategy,” we are referring to the ability to return and draw additional cards. The above figure works out to be a 0.002% chance of hitting a royal flush. So, for example, playing 300 hands per hour of video poker, will result in a Royal Flush hitting about every 133 hours. Put another way, if you play 10 hours a weekend, you will average one Royal Flush every three months. So with all that said, what is the answer to the question stated? There is no real reason to purely pursue a Royal Flush in video poker. Playing for months on end without potentially once hitting your target will be boring and infuriating. That said, there are strategies similar that we will consider now. Let’s start off with the actual payouts for a standard “Jacks or Better” style of video poker so we have some context here. 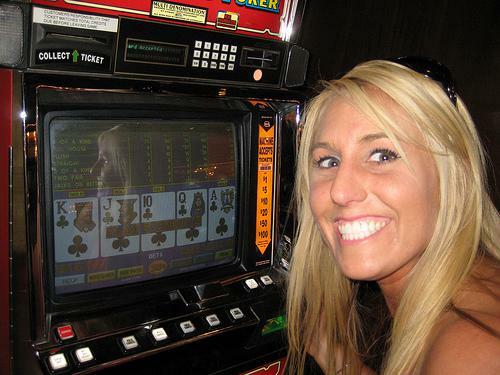 One fairly popular strategy dictates only striving for the top hands when playing video poker. So for example, while clearing out the possibility of playing any other hand but the Royal Flush might not be such a good idea, only going after, say, Royal Flushes, Straight Flushes, and Four-of-a-kinds might be an advantageous way to play for some players looking for a bit more efficiency. Consider: the payouts for the smaller hands are so negligible when compared to the bet, it’s almost a waste of time to pursue them. One four-of-a-kind, for example, will make up for more than four flushes. This is a very aggressive type of betting strategy, and it is best employed when you find yourself with some extra cash, or you are just looking to get crazy. You wanna get nuts? Lets gets nuts! You don’t need that FreePlay option. Dive right into the real money play and some absolutely insane winnings.